Efforts of the leadership of the All Progressives Congress (APC) to reconcile the Executive and the Legislative arms of government, over plans to override President Muhammadu Buhari’s veto of the Electoral Act (Amendment) Bill, 2018, may have suffered a setback as most Senators insist on going ahead with their plan. 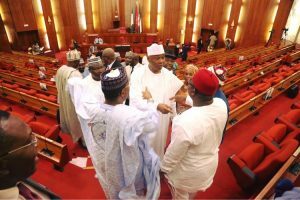 It was gathered at the weekend that after the rapprochement of the Senate APC caucus with the APC leadership, last week, Senators loyal to Senate President, Bukola Saraki appear resolute in going ahead with the override of the president’s veto. Daily Sun learnt that APC senators and their colleagues in the PDP, who are rooting for the override, have closed ranks. It was gathered that PDP leaders in the Senate have met with key loyalists of Saraki, who are spearheading the move. An APC senator from the North East represented Saraki’s side at the meeting, while a ranking PDP lawmaker from the South East represented the PDP. APC senators, who were hitherto undecided, following recent meetings, have joined forces with the Like Minds Forum loyal to Saraki. Their reason, it was gathered, was borne out of threats, allegedly from governors of their respective states not to allow them secure return tickets to the Red Chamber in 2019, if they support the move to override Buhari’s veto. Last week, the Oyegun-led NWC met with the APC caucuses in the National Assembly, in a bid to halt the proposed plan. Buhari had rejected the bill on the excuse that his assent would infringe on the constitutional powers of the Independent National Electoral Commission (INEC) and that signing the bill will be make the National Assembly appear as if it legislating for the states on local government-related issues. However, in a memo sent to the Senate President by the the National Assembly’s Legal Department, it faulted the president’s three reasons for rejecting the bill. The legal department, in the memo, gave the National Assembly a clear go ahead; if it wanted to override the president’s veto. In the aftermath of that verdict, National Assembly members started collating signatures on a possible override of the president’s veto. It was learnt, yesterday, that pro-Saraki senators are unrelenting in their push while the president’s supporters are unrelenting. Conversely, the president’s supporters in Leaders of Parliamentary Support Group (Senate) were unreachable, as at Sunday night. Telephone calls from this newspaper were unanswered. Meanwhile, sources close to Saraki revealed that his Chief of Staff, Dr. Hakeem Baba-Ahmed, has been queried for his involvement in a meeting of northern politicians which held in Arewa House, Kaduna, at the weekend. The sources insisted that although Baba-Ahmed was at the meeting, Saraki “was not privy to the decision of the meeting,” regardless of the fact that “Baba-Ahmed read the communique. “The senate president, just as other members of his team, was surprised to see a television news report where Baba-Ahmed was presented reading the communique. “In fact, the senate president has verbally queried Baba-Ahmed and members of his media team.